October has arrived and you know what that means! Halloween is just around the corner. We know it falls on the last day of the month, but why wait until October 31st to release all of that Halloween spirit? Celebrate this new fall season all month long by visiting a few of these wonderful pumpkin patch farms that we’ve rounded up for you. No matter if you’re five, fifteen, or fifty, it’s time to release your inner Halloween fanatic and go have some ghoulish fun! Phil McGrath and his Irish-American family are fourth-generation Oxnard farmers who have been running their farm organically since 1995. Their organic Pumpkin Patch is open 11 a.m. to 4 p.m. Entrance is $4 per person and that fee includes includes one small pumpkin and a run through their green maze. If you want a place that has it all, Shawns Pumpkin Patch is for you. The pumpkin patch is open for everything from pony rides to a petting zoo, train rides, face painting, giant inflatable slides, obstacle courses, bungee jumping, a straw maze, and too many more to name. Your kids will go home tired from Shawns along with a beautiful pumpkin or two to call their own. Entrance is free and each activity has individual costs that can be found on their website. 6815 S. La Cienga Blvd., Los Angeles CA; 323-325-6314. The Pierce College Halloween Festival appeals to both younger kids and their teenage siblings. For the little ones, there are lots of kiddie rides and fun attractions like Jack the Scarecrow who puts on a show in the pumpkin patch, and for the teens there is a haunted house or a daring walk down the “Creatures of the Corn” haunted trail. They also host hayrides for the whole family and there are lots of nice-sized farm grown pumpkins to choose from to bring home with you. This cost is $5 and kids under three get free admission. 20800 Victory Blvd., Woodland Hills, CA 91367; 818-999-6300. If you are looking for a real farm setting with a real pumpkin patch, Forneris Farms is the place to be. John Forneris started his farm straight out of high school and has been successfully running it for almost 50 years now. 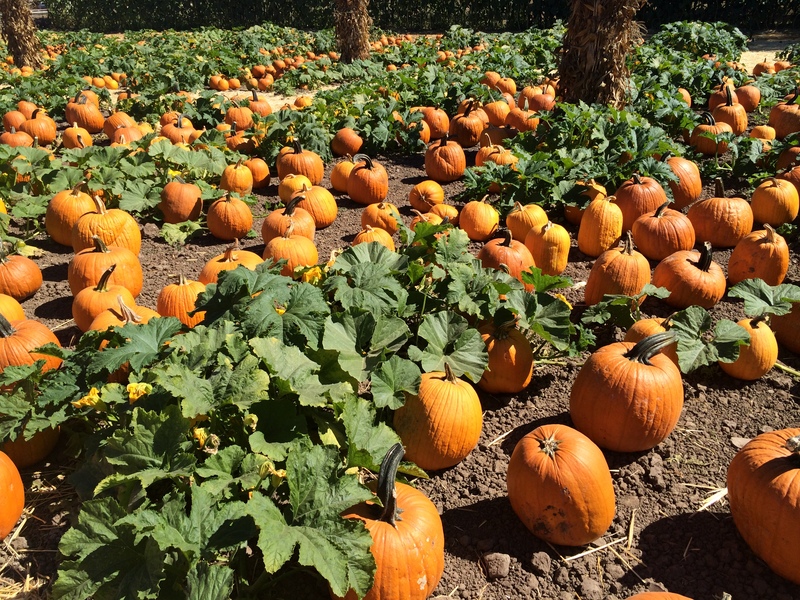 Forneris Farms is considered the most beautiful pumpkin patch in Los Angeles. They have perfectly plump pumpkins along with towering stalks of corn throughout the farm. There is a huge hay pyramid and a tractor-pulled train ride that takes you through the majestic corn mazes and gives you the experience of being on a real farm. On the weekends, they bring out the animals for a petting zoo. It’s free admission. Attractions range from $4 to $8. 15200 Rinaldi St, Mission Hills, CA 91345; (818) 730-7709. At Mr. Bones Pumpkin Patch, the most beautiful pumpkin isn’t the only thing you’ll be searching for! In between the famous pumpkin seekers like Jessica Alba and Heidi Klum are a number of great activities. Mr. Bones hosts a huge petting zoo, a straw maze to lose yourself in, pony rides and of course, face painting. Mr. Bones is also the place to go for top of the line carving tools, selling everything beyond your imagination to decorate your pumpkin. Any of the money that you pay to enter the patch goes towards your purchases. Free on weekdays. Weekends $3 for children and $5 for adults. 702 N Doheny Dr, West Hollywood, CA 90069; 310-276-9827. Underwood Family Farms is unique in that they host a different theme each weekend in October. This is the place to let your imagination run wild with all of the varieties of pumpkins. You’ll love heading up to Underwood to see some of the most interesting pumpkins in all of Los Angeles. In addition, there are pumpkin carving demonstrations and on the weekends, pig races, delicious food, wagon rides, and live entertainment! Weekends are $15, weekdays are $3. Games and attractions are available at an additional cost. 3370 Sunset Valley Rd, Moorpark, CA 93021; 805-529-3690.